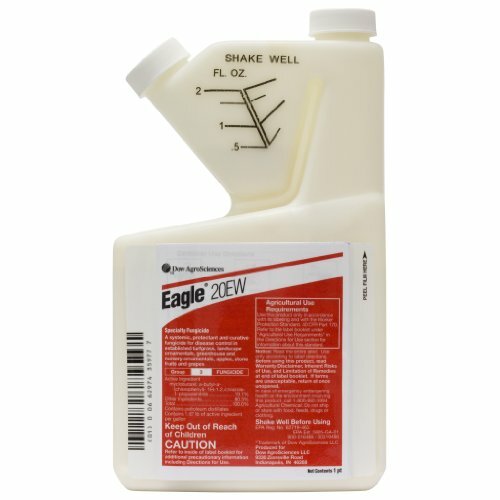 This liquid is all you need to prevent a wide range of tough diseases that threaten your turf, fruiting trees, nursery and landscape ornamental plants, including: • Powdery Mildew• Rust• Scab• Ascochyta Blight • Poinsettia Scab•Black Spot• Many turf diseases One-pint bottle of concentrate. The active ingredient is myclobutanil, which protects new foliage by moving upward through the plant tissue as it grows, leaving your greens healthy and playable. For use on: over 100 ornamental and fruit tree species; ornamental plants in fields, greenhouses and landscapes; roses, chrysanthemums, daylilies and poinsettias. General application rates are 1.2 to 2.4 oz per 1000 sq ft per application. Not to exceed 13.8 oz per 1000 sq ft per year. Works best as a preventative in a regular maintenance program. Tank mixes well with other fungicides.